Pioneers in the industry, we offer atomic emission spectrometer and spectrometer for pure copper analysis from India. In order to make the finest range of Atomic Emission Spectrometer available in the market, we abide by the guidelines of the industry and utilize the finest raw materials and modern machines. This ensures the product’s performance and longer service life. Further, the product with highly standardized quality is known to be marked at the most reasonable rate possible. For catering the variegated demands of our respected clients, we are highly engrossed in providing a wide range of Spectrometer for Pure Copper Analysis. 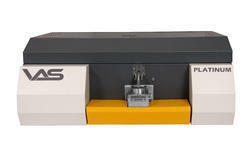 Looking for Atomic Emission Spectrometer ?